Zustand: Ein paar rein optische Gebrauchsspuren am Koffer, 100% funktionstüchtig, Nichtrauchergerät. Lieferumfang: Pearlman TM-1 Röhren Mikrofon, Netzteil, Spinne, Kabel, Koffer. 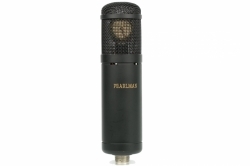 Produktinformationen "Pearlman TM1" The Pearlman TM 1 Microphone was designed by and is hand made by Dave Pearlman of ROTUND RASCAL RECORDING STUDIO. It is a high quality microphone made for professional studio use but priced for the home recordist. Many studios using digital recording, (Pro Tools, etc. ), need a front end system to warm up their recordings. This mic is for you!